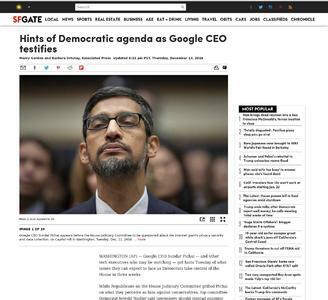 WASHINGTON (AP) — Google CEO Sundar Pichai — and other tech executives who may be watching — got hints Tuesday of what issues they can expect to face as Democrats take control of the House in three weeks. While Republicans on the House Judiciary Committee grilled Pichai on what they perceive as bias against conservatives, top committee Democrat Jerrold Nadler said lawmakers should instead examine issues such as the spread of misinformation online and Russians' efforts to influence U.S. elections online. The issue of user privacy also came up over and over.